Tips Archives - RunStuRun :. Headed to Boulder early hoping to get in a few miles before meeting up with the crew but that didn’t happen so we started together shortly before 9:00. We wound our way around part of the Backroads course and I ended up way north on CO66 before heading back to Boulder. Not too much to talk about other than really working on managing lingering ailments and getting in the miles. For the most part, I was successful. After 3 hours things started to get a little ouchy for sure but nothing that sparked tremendous concern – mostly just the standard fatigue and soreness that comes with the territory when logging that much time on one’s feet. These small increases every week are paying off, however. I am feeling super fit and recovery happens quickly. People ask about nutrition during ultra running a lot and aside from some of the standard items (gels; “real” food like pb&js, wraps, fruit; etc.) I have started working in some fluid-based nutrition as well. 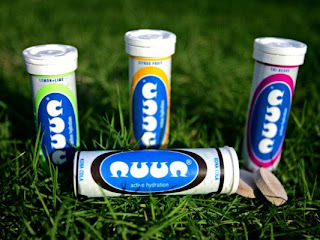 I have been using nuun exclusively for the past year or so and find it to work really well. I recently started working Charles Corfield’s famous “Rocket Fuel” into the mix. I’m trying to get more info about that so check back for a full report. Thus far, however, it seems to be working really well for me both during and post running. I have been using a 1:1 mix of Waxy Maize and Maltodextrin coupled with a tab of nuun per bottle. I have the feelers out to Mr. Corfield (3rd place in the ’07 LT100) and will let you know what more I find out. Most of the top talent whack down gels throughout the races. I am not quite sure how they handle this but it seems to work well for them. I will supplement with gels and do use gels exclusively during shorter, faster events like marathons (maybe that is the key – make 100 miles short and fast and you are golden!) but for longer runs, I tend to stick with more solid fare and try to work in as much real food as possible. When I did the LT100 in ’07 and the Silver Rush in ’08, I relied pretty much exclusively on real food. For the LT100, I relied on food my crew made for me: PB&J wraps, avocado wraps, bean burritos, fruit, trail mix, tomato/avocado soup and the like. I had decent success with this and found, for me, the avocado wraps worked really well (1/2 of an avocado and some pink sea salt wrapped in a tortilla). Being a vegan, I didn’t want to rely on aid stations and didn’t want to get into a situation where I needed nutrition but was unable to find anything that suited me. I took a slightly different approach to the Silver Rush in ’08 (mostly because I wanted to approach this event more casually to take some of the pressure off) and actually did use the aid stations which provided chips, pretzels, fruit (melons and bananas) and soda. I made the mistake of filling up with some energy drink at one of the stations that did NOT go down well, so definitely beware. I supplemented with my own food for the start (pb&j and avocado wraps) and put more in my drop bag for resupplying at the turn. The best practice is to well… practice! Grab a burrito and go for a run. See what works well for you. Be prepared for wacky cravings during events but try to stick with foods and supplements with which you are familiar and have tried in training. Nothing worse than stomach problems during an event.